Alinsky Fan Clinton Tells Europeans: "Never Waste a Good Crisis"
Barack Obama is not the only fan of Saul Alinsky in the Administration. 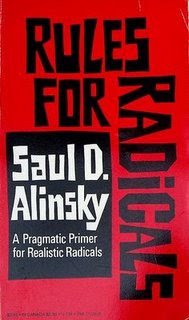 Saul Alinksy’s Rules for Radicals is a favorite in leftist circles. It was no accident that Hillary Clinton chose to write about Saul Alinsky for her senior thesis at Wellesley College. Hillary was a huge fan of the radical socialist. She is well versed on the “Cloward-Piven Strategy” of forcing political change through manufactured crisis. James Simpson wrote more about this at the American Thinker. Today, Hillary Clinton reverted back to her Alinsky ways. She urged her European audience to, “Never waste a good crisis,” and force expensive green energy programs on the continent. Secretary of State Hillary Clinton told an audience on Friday “never waste a good crisis,” as she highlighted the opportunity of rebuilding economies in a greener, less energy intensive model. Highlighting Europe’s unease the day after Russia warned that gas exports to the EU via Ukraine might be halted, she also condemned the use of energy as a political lever.